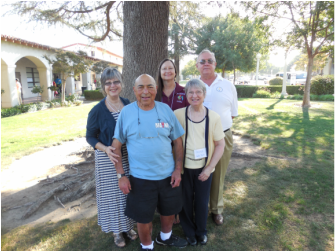 Mary Peterson, Don Covello, Debbie Simonson, Nora Olsen, Deacon Joe Olsen at the Regional Encounter in Fresno, California. Five members of the Secretariat Board (Lay Director Debbie Simonson, Spiritual Advisor Deacon Joe Olsen, School of Leaders Director Nora Olsen, Pre and Post Cursillo Director Don Covello and Secretary/Treasurer Mary Peterson) caravanned to Fresno recently for the October Regional Encounter of the National Cursillo. These Regional Encounters link each Diocesan Secretariat in their Regional area (our Region XI covers California, Hawaii and Nevada). All Secretariats who attend are affiliated with the National Cursillo and serve under the local bishop. Our Santa Rosa group was joined by other leaders in the four language groups of Region XI, including Spanish, Vietnamese, Pilipino and English. Each day began and ended with communal prayer including Holy Mass. Sandwiched in between our prayer times, we were fed delicious food for our minds and bodies, as well as our souls. This time, presentations on "How to Win Friends and Influence People" and how to deal with conflict were most informative. A Fiesta (talent show) entertained us after dinner Saturday evening. Sunday morning found us gathered in our specific language groups where each Diocesan Lay Director reported on the activities of their Secretariat. We adjourned Sunday morning until we meet again in May in Fresno for our next Regional Encounter. If you have made a Cursillo weekend and would like to attend the next Regional Encounter, please feel free to contact one of us for registration details. We would love to have you join us. The more, the merrier!